University of Oregon President Michael Schill moderated a Tuesday discussion at the UO on the future of wood products manufacturing and design, highlighting the role education and research can have in creating jobs and boosting the economy. 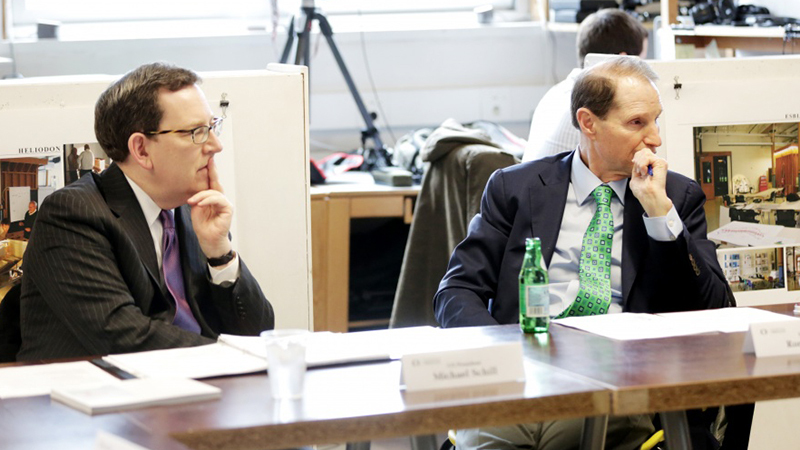 The roundtable included U.S. Sen. Ron Wyden, D-OR, city of Springfield leaders and UO and Oregon State University faculty members, research associates and students. Wyden opened the meeting by asking what the future of wood products should look like and how to get there. The UO and OSU are partners in the National Center for Advanced Wood Products Manufacturing and Design, which focuses on the development of innovative wood products and building components capable of being produced in Oregon. The applied research center is actively partnering with Oregon building design professionals and wood product manufacturers to drive innovation and testing for engineered wood materials, allowing Oregon to compete in emerging domestic and global markets. Schill said the kind of partnership the center represents a stage that can show what the two universities can do together. “Of course, we’re all here to talk about the work that’s being done by the University of Oregon and Oregon State University in terms of advancing Oregon wood products in the building industry and the education and research aspects of that” he said. “I’m particularly excited about this partnership with Oregon State; I think it’s a great opportunity to bring the two schools together to achieve more than we could alone.” He also pointed to the architecture school’s status as first in the nation for sustainable design education among accredited architecture schools. Earlier this month, Wyden and fellow U.S. Senator Jeff Merkley announced an Economic Development Administration grant of more than $400,000 to the center. The funds will establish an independent peer-review program to assess and compile performance information on mass timber construction related to Oregon’s building code standards. Participants in the roundtable included Springfield Mayor Christine Lundberg; Judith Sheine, head of the UO Department of Architecture; Laurence Schimleck, head of the OSU Wood Science and Engineering Department; Kevin Van Den Wymelenberg, director of the UO Energy Studies in Buildings Laboratory; G.Z. “Charlie” Brown, UO professor of architecture; Susan Reike-Smith, superintendent of Springfield Public Schools; and Jeff Towery, Springfield assistant city manager.